How do you make your sink kosher? The kitchen sink is a hotbed of treif (unkosher). Most likely, before you started thinking about keep­ing kosher, pots, pans, and dishes with traces of milk and meat products went into that sink, and hot water swirled over them, mixing everything together. The hot water can get quite hot, definitely in the yad soledet bo range [meaning “when the hand shrinks back from it” because of the heat–the point at which Jewish law considers a liquid hot]. Enameled porcelain sinks are treated as earthenware, a substance that absorbs flavors permanently. These sinks are not kasherable. Stainless steel sinks can be kashered. The kashrut preference, for both Conservative and Orthodox rules, is to have two separate sinks, one for meat and one for dairy, because a sink can so easily become treif. A double sink is possible, but difficult to keep kosher, as spills from one to the other can happen too easily. But for many people two separate sinks are not an option. This does not mean you cannot use your sink. 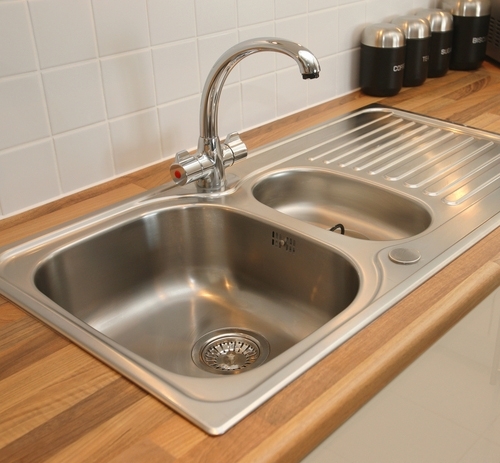 If you have only one sink, even if it is stainless, it will quickly become unkosher through normal use. But you should still kasher it when kashering your kitchen. Sinks are kashered through irui [infusion]. Scrub the sink thoroughly. Some Orthodox rabbis encourage pouring a bleach solution down the drain, but this is a mahmir [strict] position, as the drain and garbage disposal will never come in contact with food you actually prepare to eat. Do not use the sink for 24 hours. Then boil water and pour it all over the sink, including the faucet and the lip of the sink that overlaps onto the counter (don?t for­get to put towels or rags on the floor). Some sinks have a retractable spray attachment, the nozzle of which is usually plastic. According to some Orthodox rabbis, this is not kasherable and should be replaced or not used. According to Conservative halakhah (Jewish law), it is kasherable–include this nozzle during the irui process. If you have only one sink, how do you use it without causing your dishes to become treif? You cannot soak dishes in a sink filled with water–that could cause any residual unkosher flavors to contaminate your dishes. If you are dexterous and careful, you might be able to hold the dish or fork or pot in your hand during he entire time you wash it, making sure not to let it touch the treif sink. If it falls–you have to kasher it again. Realistically, get separate plastic tubs that fit in your sink, one for meat and one for dairy. A more lenient approach is to use separate rubber-coated racks, and the dishes can rest on this rack (like hot pots can rest on a trivet on the countertop) as you wash them. Keep with your color theme here to avoid confusion–for example, red or pink racks and tubs for meat, blue for dairy, yellow for pareve [neither milk nor meat] items. , by Lise Stern. Copyright (c) 2004 by Lise Stern. Used by permission of HarperCollins Publishers Inc. Pronounced: KAH-sher, Origin: Hebrew, to make kosher, usually referring to dishes, cookware or a kitchen. Pronounced: kahsh-ROOT, Origin: Hebrew, the Jewish dietary laws.